Evaluated as espresso. Rose-like flowers, chocolate fudge, cannabis flower, black cherry, fresh-cut cedar in aroma and small cup. Syrupy, vibrant mouthfeel; richly drying, sweet-savory finish. This coffee levitates in three parts milk, with rich notes of rose-like flowers ensconced in deep chocolate and a cannabis-like muskiness. Sweetly savory, chocolate-toned. Baker’s chocolate, singed cedar, gardenia, plum, molasses in aroma and cup. Crisply sweet-savory structure; delicate, satiny mouthfeel. The richly drying finish centers around baker’s chocolate and pleasantly smoky aromatic wood notes. Spicy, earth-toned, lightly roasty. Dark chocolate, fresh-turned earth, gently scorched oak, pipe tobacco, hints of peppercorn and sweet flowers in aroma and cup. Vibrantly sweet-savory in structure. Plush, velvety mouthfeel. Chocolate in particular carries into a round, resonant finish, complicated by continued hints of tobacco, earth and flowers. Fruit-toned, engagingly complex. Mulberry, musk, cocoa, freesia-like flowers, elderflower liqueur in aroma and cup. Balanced in structure (sweet, tart, savory); plush, lively mouthfeel. The resonant finish leads with fruit (think berry medley) in the short, while the long is characterized by spice-toned florals and a hint of sweet ferment. Evaluated as espresso. Richly sweet, floral-toned. Magnolia, baker’s chocolate, salted cashew, marjoram, black cherry in aroma and small cup. Crisp yet velvety mouthfeel; dry, sweetly savory (herbaceous) finish. In three parts milk, bittersweet cocoa tones predominate, supported by ripe black cherry and salted cashew. Evaluated as espresso. Richly sweet, caramelly. Orange zest, dark caramel, fir, raisin, freesia in aroma and small cup. Full, satiny mouthfeel; wood-framed, caramel- and fruit-toned finish. In three parts milk, raisin and caramel notes are foregrounded, with spice-toned, freesia-like flowers underneath. 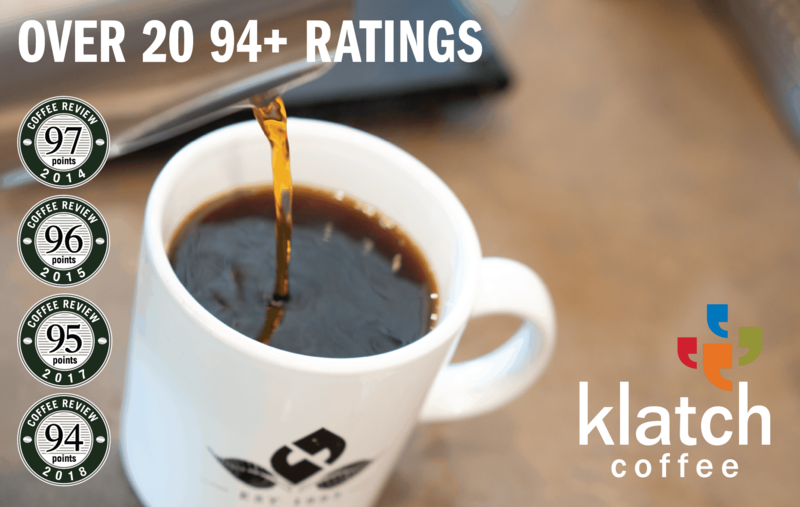 The Curve Coffee Roasting Co.
Evaluated as espresso. Intricate, layered, richly sweet. Narcissus, dark chocolate, singed cedar, black truffle, ripe papaya in aroma and small cup. Lively, syrupy body. Floral, sweet-savory finish, with notes of dark chocolate throughout, supported by narcissus and black truffle. In three parts milk, the chocolate and floral notes are both rounded and enlivened. Delicately sweet, richly savory. Red currant, butterscotch, fresh-cut cedar, tamarind, lantana-like floral notes in aroma and cup. 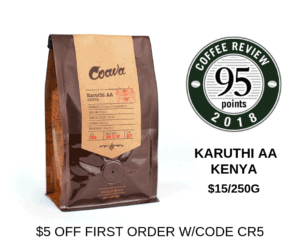 Bright, sweet-tart structure with lively acidity; syrupy-smooth mouthfeel. The short finish is flavor-saturated, consolidating in the long to notes of red currant and butterscotch. Rich-toned, fruit-forward. Strawberry, baker’s chocolate, honeysuckle-like flowers, almond, frankincense in aroma and cup. Bittersweet structure with brisk acidity; plush, syrupy mouthfeel. The short finish is centered around berry and floral notes, while cocoa-toned almond with a hint of frankincense characterizes the long. Sweetly earth-toned, spice-forward. Aromatic orchid, moist fresh-fallen leaves, cashew, cinnamon. Bing cherry in aroma and cup. Sweet-tart-structure with crisp acidity; plush, full mouthfeel. The finish is resonant and richly drying, with leading notes of aromatic orchid and cherry in the short and oak and cinnamon in the long. Deeply rich, sweet-savory. Rhododendron, mango, almond brittle, thyme, oak in aroma and cup. Sweet-toned, savory structure; full, satiny mouthfeel. The gently drying finish consolidates to notes of oak and almond, with a hint of sweet herb suggesting thyme. Rich-toned, balanced, deeply sweet. Apricot, dark chocolate, hazelnut, citrusy lantana flowers, cinnamon in aroma and cup. Crisply sweet in structure with lively acidity; lightly syrupy mouthfeel. Notes of sweet-tart stone fruit carry into the long finish, supported by dark chocolate and a hint of cinnamon-like spice. Richly sweet, spice-toned. Baker’s chocolate, cinnamon, banana, cashew, citrusy lantana flowers in aroma and cup. Bittersweet in structure, with juicy acidity; velvety-smooth mouthfeel. Notes of baker’s chocolate and banana are sweetly resonant in the short finish, spice-toned florals resurface in the long. Evaluated as espresso. Richly sweet, chocolate-toned. Chocolate fudge, magnolia, almond brittle, tangerine zest, cedar in aroma and small cup. Crisp, satiny mouthfeel; wood-framed, floral-toned finish. In three parts milk, notes of chocolate fudge resonate and linger, along with sweet magnolia-like flowers and hints of cedar. Sweetly roast-rounded, cocoa-toned. Baker’s chocolate, black currant, rose hip, singed cedar, almond brittle in aroma and cup. Crisply sweet-tart structure; delicate, syrupy mouthfeel. The richly drying finish centers around tart floral notes and baker’s chocolate. Delicate, quietly sweet-toned. Roasted cacao nib, red grape, fresh-cut fir, lemon zest, gardenia-like flowers in aroma and cup. Gentle, rounded structure; crisp, satiny mouthfeel. The finish consolidates to notes of lemon zest and gardenia with a hint of fresh-cut fir. Richly sweet-savory, spice-toned. Black currant, roasted cacao nib, freesia-like flowers, almond, molasses in aroma and cup. Sweet-savory in structure with crisply bright acidity; velvety mouthfeel. The quietly nuanced finish centers around black currant and freesia tones in the short, molasses and almond in the long. Delicate, sweet-toned, softly bright and balanced. Caramel, vanilla bean, cedar, almond, candied lemon zest in aroma and cup. Gently brisk in structure, light in mouthfeel. Sweet citrus framed by aromatic cedar carry into a short but pleasing finish. Round, balanced, with a quiet but deeply layered complexity. Blackberry, cocoa, pear, lavender, roasted macadamia in aroma and cup. Sweetly and roundly bright in structure; plush and lightly syrupy in mouthfeel. A richly resonant finish consolidates around cocoa, lavender and pear.